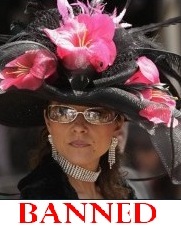 LOUISVILLE, KY - (@TheComedyNews) - The longstanding tradition of wearing your best, biggest, brightest hat at the Kentucky Derby has been officially prohibited by Derby officials. What seemed to be a jovial 2011 running of the Kentucky Derby was marred by debutanté gang violence on Saturday. According to witnesses, a gaggle horse breeders called "the Valor gang" traded taunts with a gang of family members of jockeys --- "the Filthy Fillies"--- in an adjacent, lower-tier luxury box. "Someone from the Valor gang yelled, "plebeians, your hats are poor, just like your finances", recalled a witness to the incident. At that point, a Filly gang member spotted some of the Valors, with their hats shaking as they snickered. From there, a 2-hour physical melee ensued. "All that was left was feathers, flowers, bobby-pins, and the injured laying in piles of mint and puddles of bourbon," recalled a horrified onlooker. Kentucky Derby officials determined that the glorification of hats "was beyond a reasonable doubt, the primary contributor to the culture of gang violence that has infiltrated Churchill Downs." Starting with the 2012 Kentucky Derby race, there will be no hats permitted except for baseball caps and visors with the name of a horse on them. Officials hope that this will help quell the uprising in gang violence at the race. More significantly, the new hat policies will likely turn the Kentucky Derby into more of a horse race spectacle, as opposed to the aristocratic hat show it has been for 137 years.